DIMENSIONS: Cutlass 32" long overall. 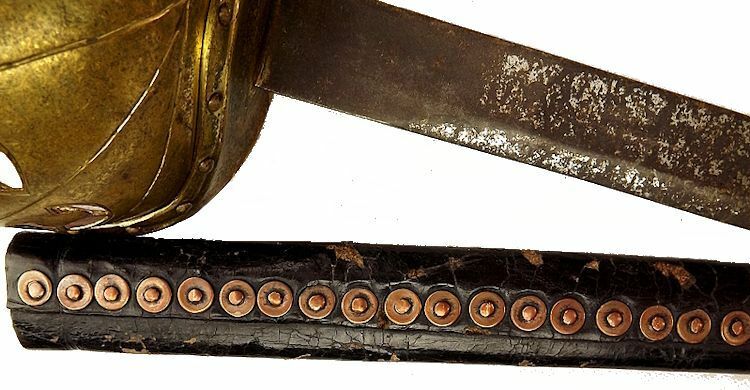 26" blade length Max width of blade 1"
Presented is a Civil War, M1860, dated 1862, cutlass with incised 1" x 3/8" "CSN" lettering on the guard that stands for Confederate States Navy. It is an unusual variation of the mainstay cutlass used by the Union Navy from 1860 into the 20th Century. The weapon has its original scabbard with throg. There are other examples of this style cutlass appearing on the internet, but there is no known documentation that it was made by Ames. The condition of the scabbard is excellent with some minor surface loss and cracking, but there are no breaks or deep cracks. There are 55 copper rivets running down the back. 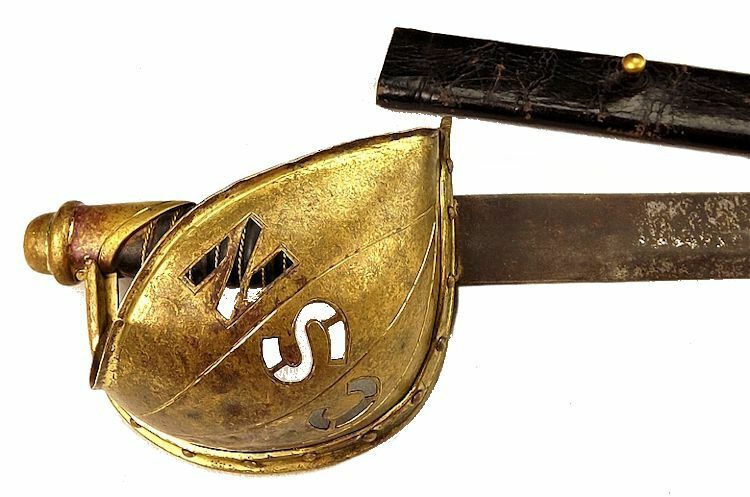 The knuckle bow has a flange which accepts an elliptical brass cup which acts as a hand guard. The curved guard is riveted to the flange and forms a solid half basket guard. The guard, grip, leather covering, and wire wrap are near perfect. The blade has a mottled grey finish interspersed with areas of polished nickel. CONDITION: In addition to that which was explained elsewhere, the entire hilt assembly, guard and grip are in excellent condition with only superficial marks of age over the past 154 years. The grip is wrapped in two strand copper wire. The original gold wash is mainly present with some loss due to aging. A patina has turned the uncovered brass golden. The hilt and blade are tight. The leather washer is missing. The scabbard is complete and has the original throg which is a rarity. Both are impossible to find if missing. There is some minor loss of leather and cracking. The blade is has large areas of blackening with some polished nickel present. There is no pitting. MARKINGS: All are sharp and distinct. 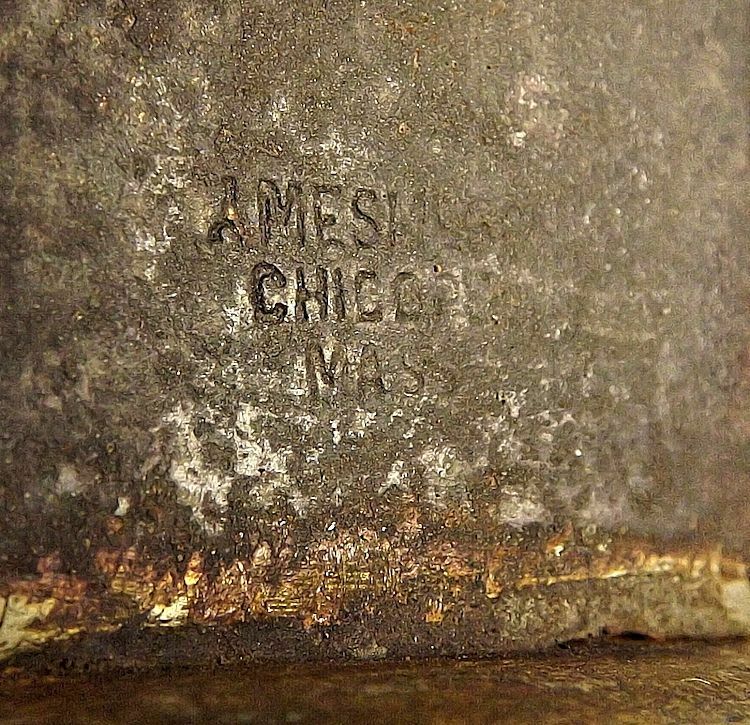 On the obverse is the Ames Mfg Co. with Chicopee, Mass on three lines. 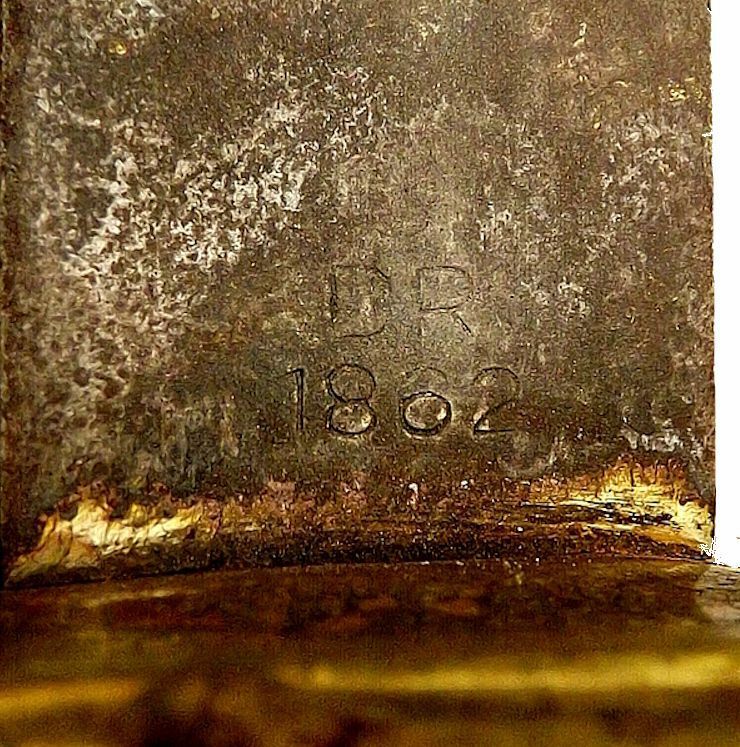 On the reverse there is the inspector's initials over the 1862 date on the ricasso. There are no other markings. 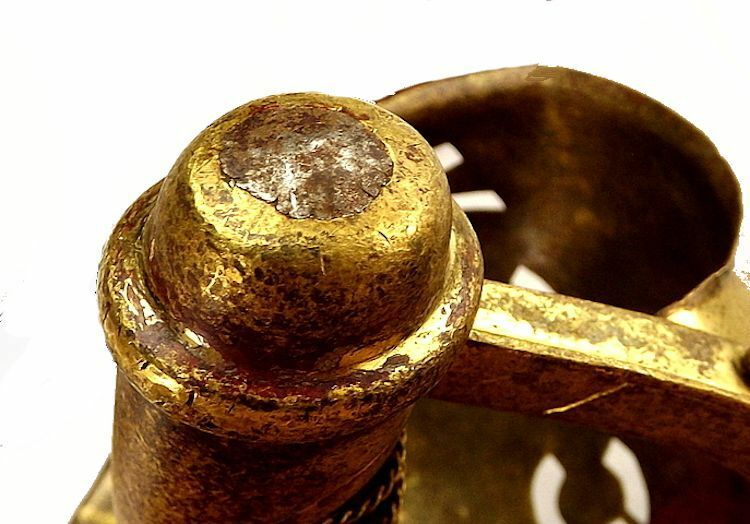 Top of pommel showing peened tang. BRIEF HISTORY Ames Mfg. Co.: The Ames Manufacturing Company, Chicopee, Massachusetts, was founded in 1832 by James Tyler Ames and his brother, Nathan Peabody Ames. The company manufactured small tools, cotton machinery, swords, cannons, and did casting of bells. They started production of military contract swords in 1832 with the M1832 foot artillery sword, and ended with the M1906 cavalry saber in 1906. 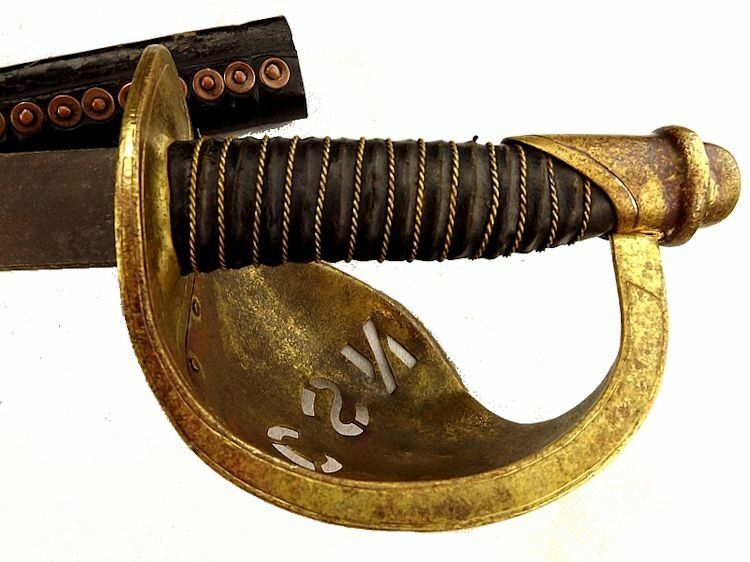 Ames produced more swords for the American military than any other company before or since, totaling over 200,000 swords in service by the end of the Civil War. In that time, at least ten different manufacturing marks were used on the swords. A little knowledge of the company history helps place a date range for when each stamp was used. When the company started producing swords it was led by Nathan P. Ames, and most marks reflected that fact. In 1847, Nathan died and left the company to his brother James. The markings on the blades were immediately changed from N.P. Ames to Ames Mfg. Co. In 1848, the town of Cabotville was incorporated into Chicopee, Massachusetts, and the marks were once again changed to reflect this. Blades dated as late as 1850 may still bear the Cabotville stamp, as the old dies were probably used until they were worn out. In a much reduced state, they are still in business today. ACCEPTED FORMS OF PAYMENT are Bank wire transfer, cashier's check, or personal check in which case the item will be held until cleared. Our prices are quoted net to seller, but credit cards may be accepted through PayPal by arrangement at extra cost. This is a complete example of an Confederate Naval Officer's Civil War Cutlass which will be hard to duplicate!